The Environmental Studies Center and Council proudly presents Youth Driven Cinema, a K-12 Student Film Festival. 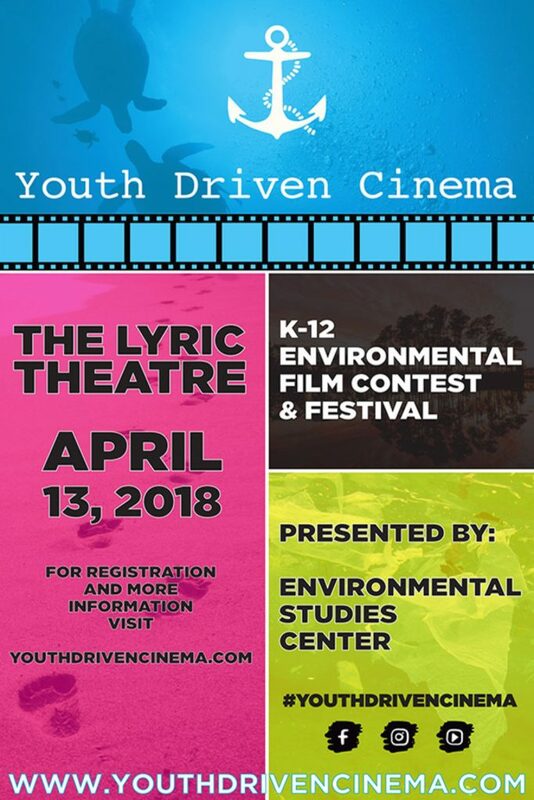 Youth Driven cinema is the first event of its kind in Martin County and will be held at The Lyric Theatre April 13th (doors open at 6:00). The Mission of Youth Driven Cinema is to educate and engage the youth of Martin County by fostering community involvement within the arts and sciences. Tickets are available ahead of time at the Lyric Box Office and the night of (seating limited). This year’s theme “Spread the Word, Florida’s Ecosystems Need Our Help,” asks students to find ways they can positively impact their environment. Film crews will be comprised of up to 4 students within the same grade level category. There is also a category for videos by larger groups or classrooms called School of Fish. The top 5 short films from each category will be presented at the film festival. Prizes will be awarded in 4 categories; School of Fish, Elementary, Middle, High School.